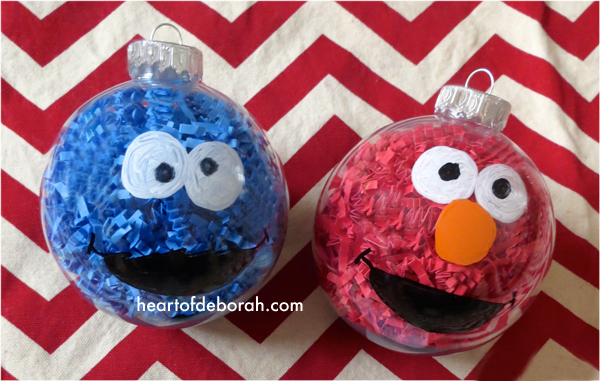 BRILLIANT DIY Sesame Street Christmas Ornaments for Kids to Make! This post contains affiliate links for products we love. Also please note this is a fan tribute, this post is not endorsed by or contracted by Sesame Street. 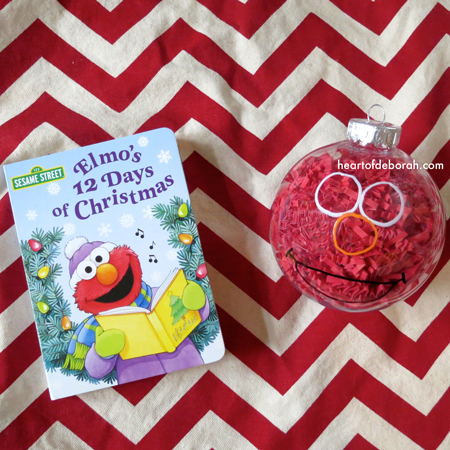 Continue reading for our DIY Sesame Street Inspired Christmas Ornaments. Growing up I loved sesame street and now that we have a daughter it’s fun to share some of my favorite things with her. 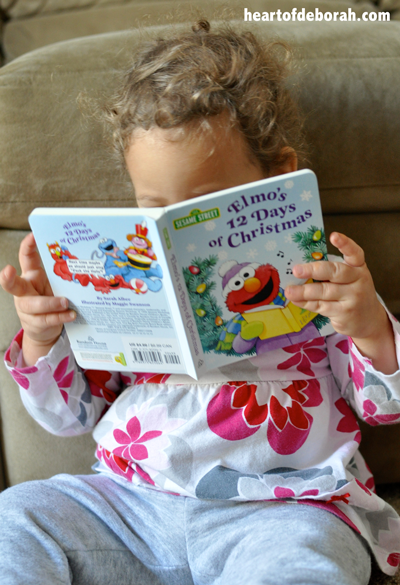 This year we added the Elmo’s 12 Days of Christmas board book to our christmas book collection. It’s the perfect handheld book for toddlers and it easily fits in your purse for on the go traveling purposes. We were inspired by our new book and favorite cartoon characters to make our own DIY Sesame Street Inspired Christmas Ornaments. So with the help of my daughter we created Cookie Monster and Elmo ornaments. This kid’s craft is perfect for a day inside with your children. I think they are adorable to hang on your own tree or give them as kid made gifts! RELATED: Olaf Fingerprint Christmas Ornament Even Your Toddler Can Make! Paint Markers (White, Black, and Orange). I purchased a variety of fine tip and medium tip. You can buy a lot of these items online and I love hassle free shopping! I also found a lot of these supplies are at the dollar store, which is a great option because it’s affordable. First open the paper shred and stuff your ornaments with blue or red paper. We used red for Elmo and blue for Cookie Monster. Our toddler surprisingly sat for 10-15 minutes to help me stuff the ornaments. 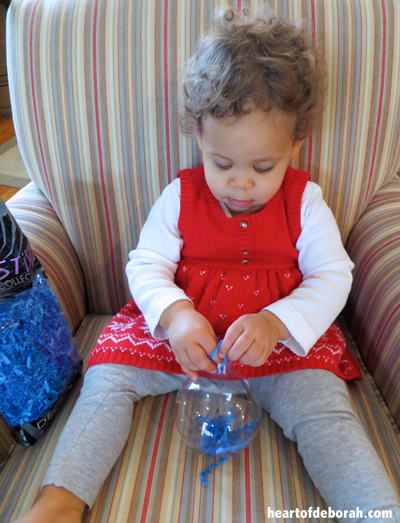 She enjoys fine motor tasks like this, but it may not be suitable for all children and that is okay. If they need some help it’s no problem. Next, add the eyes, nose and mouth to the ornament with your paint markers. The cartoon faces are somewhat simple so I was able to freehand the eyes and mouth. Please note, I am not artistic at all! You can do this with little artistic ability! If your children have a difficult time with this you could shape the outline and let them fill in the white eyes and the colors of the mouth and nose. You are finished! Now it’s time to hang your beautiful ornaments inspired by sesame street on your tree. If you make this craft we’d love to see your work! Be sure to use #Heartofdeborah or tag us @heartofdeborah on Facebook and Instagram. I’ll repost some of my favorites. This ornament is a part of the awesome Mama Miss “10 Days of a Kid-Made Christmas” with over 70 ornaments inspired by our favorite children’s books! 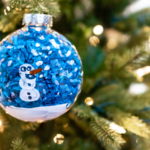 Tell me about your favorite Christmas ornaments for kids to make in the comments and check out these other awesome ideas below! 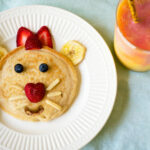 These are so, so cute! 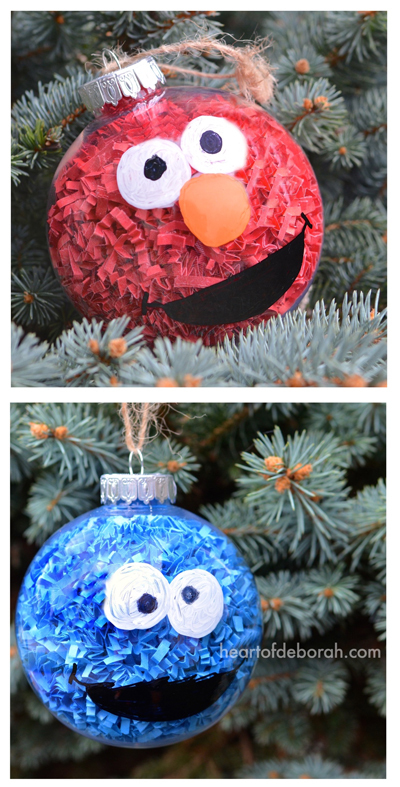 I have a couple of nieces who love Elmo, and will surely love these ornaments:). I love this! So easy! I’m thinking of making Oscar the Grouch! Oscar would be adorable! If you make it please share it, I’d love to see it. What a great fine motor activity!!!!!!!! I didn’t even think of that, but you are right! I just made the Elmo ornament for my 1 yr old grandson. It actually turned out pretty well. And let me tell you right now, I have NO artistic talents. Thanks so much for the inspiration! These are so adorable – and they even look easy enough for me to give them a try, lol!